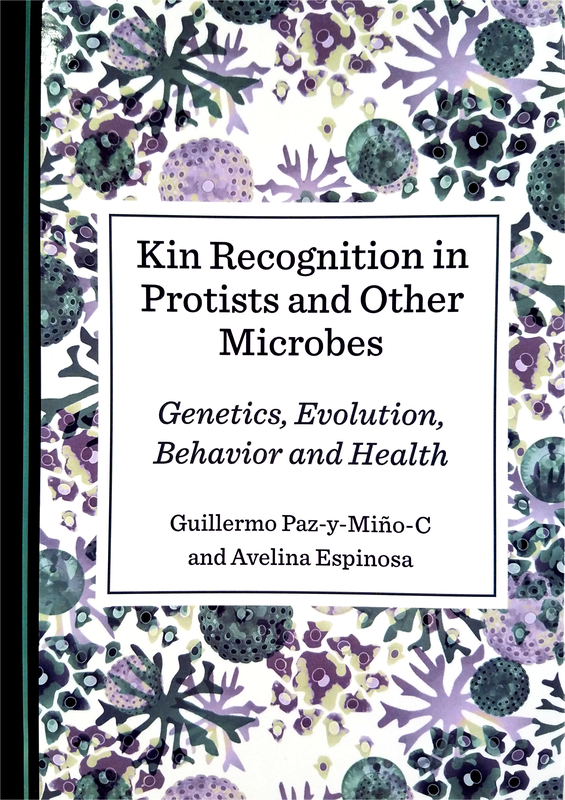 New BOOK 2018 — “Kin Recognition in Protists and Other Microbes” covers the advent of microbial models in the field of kin recognition; the polymorphisms of green-beard genes in social amebas, yeast and soil bacteria; the potential that unicells have to learn phenotypic cues for recognition; the role of clonality and kinship in pathogenicity (health); the social and spatial structure of microbes and their biogeography; and the relevance of unicells’ cooperation, sociality and cheating for our understanding of the origins of multicellularity. Kin Recognition in Protists and Other Microbes is the first volume (428-pp hardback) dedicated entirely to the genetics, evolution and behavior of cells capable of discriminating and recognizing taxa (other species), clones (other cell lines) and kin (as per gradual genetic proximity). It covers the advent of microbial models in the field of kin recognition; the polymorphisms of green-beard genes in social amebas, yeast and soil bacteria; the potential that unicells have to learn phenotypic cues for recognition; the role of clonality and kinship in pathogenicity (dysentery, malaria, sleeping sickness and Chagas); the social and spatial structure of microbes and their biogeography; and the relevance of unicells’ cooperation, sociality and cheating for our understanding of the origins of multicellularity. Offering over 200 figures and diagrams, this work will appeal to a broad audience, including researchers in academia, postdoctoral fellows, graduate students and research undergraduates. Science writers and college educators will also find it informative and practical for teaching – BOOK website. ‒ Authors: Guillermo Paz-y-Miño-C and Avelina Espinosa. “New theories predict phenomena we see only when we know to look. A stunning example of this is kin recognition, predicted by Hamilton’s theory of inclusive fitness. This book is a rich treatment of kin recognition and discrimination in the microbial world, made particularly accessible by a wonderful collection of diagrams and illustrations. Anyone interested in fascinating new stories of how microbes treat their kin should read this book.” ‒ Joan E. Strassmann, Charles Rebstock Professor of Biology, Washington University in St. Louis. “Paz-y-Miño-C and Espinosa have produced a real gem! Anyone interested in the evolution of life on Earth from any perspective would find this a great read. The authors beautifully synthesize, for the first time, the historical literature (including their own considerable contributions) on taxa-, clone-, and kin-discrimination/recognition in unicellular eukaryotes (protists) and other microbes. They contribute their own observations and insights, as well as ability to place what is known about the genetics, behavioral and chemical aspects of kin recognition into a balanced evolutionary perspective. The carefully-chosen case studies, definitions of terms, and summaries provided in each chapter result in a book that is accessible to a wide range of readers; a valuable resource for experts in the field, as well as students and interested non-experts looking for a stimulating and very thought-provoking volume.” ‒ Virginia P. Edgcomb, Associate Scientist, Woods Hole Oceanographic Institution. Authors: Guillermo Paz-y-Miño-C and Avelina Espinosa. — Cambridge Scholars Publishing, United Kingdom, 2018 — Format: 15 x 21 cm (6 x 8.5 inches), 428 pages (hardback), 200+ scientific figures. — Subjects: genetics, evolution, behavior, protists/protozoa, phylogenetics, biogeography, organismal biology. The volume can be ordered directly from the publisher Cambridge Scholars – BOOK website. For a PDF sample of the first 16 pages of the book go to View Extract. See also Read Reviews. Chapter One – Kin Recognition: Synopsis and the Advent of Protists Models (13 pp). — The Advent of Protists Models. — Fig. 1.1 and Table 1.1. — Box 1.1 Essential kin-recognition terminology. — Box 1.2 Darwin and the puzzle of the sterile social insects. — Box 1.3 Hamilton and the concepts of fitness. — References. Chapter Two – The Genetics of Kin Recognition: From Many Cells to Single Cells (16 pp). — Figs. 2.1 to 2.6 (figures include subfigures). — Box 2.1 Essential terminology for this chapter. — Box 2.2 FLO genes and flocculation in yeast. — Box 2.3 The tgrB1 and tgrC1 genes in Dictyostelium discoideum. — References. Chapter Three – Can Protists Learn Phenotypic Cues to Discriminate Kin? (34 pp). — Association, Phenotype Matching and Kin-detection. — Conclusion. — Figs. 3.1 to 3.9 (figures include subfigures). — Box 3.1 Jennings and The Psychology Of A Protozoan. — Box 3.2 Error-correction in simulated mate-choice trials in the heterotrich ciliate Spirostomum ambiguum. — References. Chapter Four – Entamoeba Clone-Recognition Experiments: Morphometrics, Aggregative Behavior, and Cell-Signaling Characterization (20 pp). — Morphometrics. — Aggregative behavior. — Cell-signaling Characterization. — Summary of Results and Conclusions. — Figs. 4.1 to 4.6 (figures include subfigures), and Table 4.1. — Box 4.1 Methods to culture amebas in the laboratory, measure them individually and in clusters, assess their aggregative behavior, and characterize their cell-signaling secretions. — References. Chapter Five – The Prokaryotes’ Tale (103 pp). — Myxobacteria. — Bacillus. — Burkholderia. — Escherichia. — Kin vs. Kind. — Proteus, Pseudomonas, Vibrio, Agrobacterium and Other Prokaryotes with Discrimination Abilities. — Quorum Sensing and Kinship. — Biofilms and Kinship. — Prokaryotic Multicellular Aggregations. — Kinship, Spatial Structure and Micro-Sociogeography. — Conclusions. — Figs. 5.1 to 5.31 (figures include subfigures), and Table 5.1. — Box 5.1 Essential terminology for this chapter. — Box 5.2 Kind discrimination and kind selection. — References. Chapter Six – Protists’ Clonality, Kinship and Pathogenicity (45 pp). — Plasmodium. — Trypanosoma and Its Social Migration. — Conclusions. — Figs. 6.1 to 6.13 (figures include subfigures). — Box 6.1 Essential terminology for this chapter. — References. Chapter Seven – Micro-Biogeography: Kinship and Social/Spatial Structure (129 pp). — Coenochloris and Chlamydomonas. — Oxyrrhis. — Pseudo-nitzschia, Thalassiosira, Skeletonema and High(er)-Taxa Community Analyses. — Dictyostelium (social amebas) and Meriderma. — Tetrahymena. — Plasmodium: falciparum versus vivax. — Trypanosoma: brucei versus vivax versus cruzi. — Conclusions. — Figs. 7.1 to 7.43 (figures include subfigures), and Table 7.1. — Box 7.1 Essential terminology for this chapter. — Box 7.2 The everything is everywhere (EiE) hypothesis. — Box 7.3 Scenarios of clone-clone discrimination in social ameba. — References. Chapter Eight – Multicellular Aggregations: From Single Cells to Many Cells (35 pp). — Experimental Evolution of Multicellularity in Chlamydomonas reinhardtii. — Aggregative Multicellularity in Dictyostelium. — Relatedness, Cheating, and Genetic-Conflict Resolution. — Conclusions. — Figs. 8.1 to 8.7 (figures include subfigures). — Box 8.1 Essential terminology for this chapter. — References. Chapter Nine – Conclusions and Future Directions (21 pp). — “…This work is the first in which taxa-, clone- and kin-discrimination/recognition in unicellular eukaryotes (protists) and other microbes is organized from a historical perspective (i.e. the advent of protists and microbial models in the field of kin recognition; Chapters One and Five). We discuss(ed): the genetics of kin discrimination/recognition in unicellular organisms, including green-beard-gene polymorphisms in social amebas, yeast and bacteria (Chapters Two and Five); the potential that microbes have to learn phenotypic cues during socio-sexual encounters and use such decoded information adaptively in behavioral responses (Chapter Three); the exchange of chemical signals, often released into the environment, and used for taxa-, clone- or kin-discrimination/recognition in amebas, ciliates and soil bacteria (Chapters Three, Four and Five); the relevance of clonality and kinship for pathogenicity, particularly in Entamoeba, Plasmodium and Trypanosoma, and for biofilm formation in the bacteria Escherichia, Pseudomonas, Staphylococcus and Vibrio (Chapters Four, Five and Six); the correlations between kinship, social structure, spatial distribution and micro-biogeography at local, regional and continental scales, as well as at microscopic levels (Chapters Five and Seven); the relevance of protists’ and other microbes’ cell aggregations, cooperation, sociality and cheating (or avoidance of it) for our understanding of the origins and evolution of multicellularity (Chapters Five and Eight); and the directions that the field of kin-discrimination/recognition shall take in the future now that microbes are increasingly being studied —under such perspective— in the laboratory and field (Chapter Nine)…” — Fig. 9.1. — References. Appendix A Figures’ Notes and Sources (5 pp). — Appendix B Media Resources (6 pp). — About the Authors (1 p). Book citation — Paz-y-Miño-C, G., and A. Espinosa. 2018. Kin Recognition in Protists and Other Microbes: Genetics, Evolution, Behavior and Health (428 pp). Cambridge Scholars Publishing, United Kingdom. — ISBN-13: 978-1-5275-0764-7 — ISBN-10: 1-5275-0764-5 — BOOK website. — Read Reviews.